Scan,digitise;restore, repair,retouch & manipulate images. Illustration, high res printing; convert VHS; Hi8 video Super8 standard 8mm &16mm films. Wellington and NZ wide via website file up-loader and courier. * Scanning images (photos, negatives - all sizes; slides and artwork). * Digital image editing (rebuilding, enhancing, restoring, repairing and colouring). * High quality professional printing of images (giclee prints) and photographs. * Document digitising and OCR. * Digitise & edit Hi8 video; VHS tapes & Super & standard 8mm &16mm film. 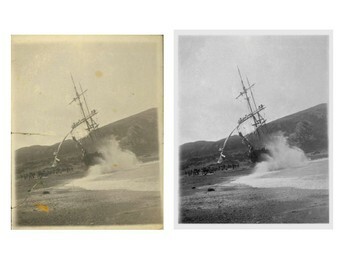 WHY RESTORE YOUR IMAGES WITH US? Customized service based in Wellington; servicing NZ and the world. Upload your images using our web page dedicated online file up-loader or courier your items to us. Jo has an artist’s eye, 10 years experience - retouching, restoring, & scanning images. She has the experience to scan your images for future restoration; archiving and print. On completion of your job digital copies of the original scans and restored images are supplied on DVD or USB. We can also print beautiful high resolution archival prints of your restored images in sizes ranging from A6 to A2 on our Epson Stylus Pro printer. WHY SCAN YOUR IMAGES WITH US? We do it once and do it right! We have specialist software and equipment to digitise your items. Our system is colour calibrated for accurate reproduction. We output high resolution archival TIIFFs & jpeg digital images.TIFF format is ideal for archiving and preserving your images for the future& jpegs are good for easy viewing. We can digitise delicate books & documents. Optional OCR (optical character recognition) service for printed documents. Optional Index scanning service for sorting 35mmm negatives. We offer a range of options – just talk to us about your requirements. We are happy to work on family collections and large projects in stages. References available. We have more examples of our work in a portfolio available for viewing. FANTASTIC experience with with Jo! She 'cleaned up', enhanced etc an old 1916 postcard written by my great-uncle to his sis (my Grandma) from the battlefields of Gallipoli. So this was VERY special to me and an important piece of our family history. Jo did an amazing job, kept me fully informed along the way, came back to me many times to check & make sure I was happy. I am absolutely THRILLED with the completed work, which I now have framed. Thank you SO much Jo - highly recommended to all! Carterworks has my highest recommendation. Jo scanned about 350 family slides from the 1960s and was extremely helpful in going through options, avoiding unnecessary costs, communicating fully and professionally, and doing an excellent and timely job with the images. Living outside Wellington was no barrier. I will definitely use her again for any other work I have of this nature. The finished photographs we received back were just brilliant. In our dealings with Jo, she provided excellent advice from start to finish. It was such a pleasure to deal with a business that put their customers first. Very good company to deal with, helpful advice, great contact and a GREAT JOB DONE with the photos. Thanks! !